I updated a layout that I created for my January Crop. I typically start with my photos and pick my colors and papers. I let the picures dictate the sketch of the layout. Every now and then, I do it backwards. It doesn't always work. In this layout, I like how the background paper is a little darker and the white letters and snowflakes stand out more. The color of the paper does not go with the colors in my pictures. I also take most of my pictures horizontally instead of vertically. So, I found new paper and re-cut the pieces. I wanted to give the letters and snowflakes a little glimmer. I made my own glimmer mist with a friend. We took Pearl Ex, alcohol inks, hairspray and water. I bought these little spray bottles and the Mini Misters at Michaels. After some experimentation, we found that you should put water in first (not the alcohol ink) and fill it jut over 3/4 full. Add a small amount of hairpray. We took popsicle sticks to scoop some Pearl Ex into the spray bottle last. It was very much a trial and error science experience (can you say messy fun!). Shake it up ~ this is the ONLY time you want to shake the bottle!!! Once it is mixed, let it settle. Then just swirl the bottle to get the Pearl Ex to mix in, otherwise you can get a clog. I ran the letters through my cuttlebug with Swiss Dots. I cut a cardboard box down to use as a "spray spot" so my overspray was contained. I used purple to spray the letters and snowflakes. The letters and snowflakes were cut with A Child's Year. I used gems in the center of the snowflakes. Yes, that is my Tanner licking the snow in the picture!! Here is my Glimmer Misted snowflake layout! Thank you for stopping by today and I hope you have a fun science experiment day soon!! Here is my entry for Frosted Designs Fabulous Friday Metal Challenge. I took a rectangle from George at 8.12w x 5.49h (using the Real Dial feature) and welded the rectangle with rounded edges (to the left of the stop sign shape on George Shift/Lock) stretched to 0.67w x 5.49h. Next I found a scallop tag shape from Storybook (but many other carts have this same shape) and welded it to the end of the rectangle. I sized my shape to 3.70w x 5.59h. Both of these stamps came from sets I found at Michaels. Thank you for stopping by my blog! If you have a metal project or want to make one, share it with us at Frosted Designs!! Here are a couple of quick cards I made from with my Gypsy. I used My Pink Stamper's Everyday Occasions stamp set. I put a rectangle from George at 8.68w x 5.49h, a rounded corner rectangle from George at 0.74w x 5.49h and the scallop square from Storybook at 3.91w x 5.59h and welded them together. The entire group measures 9.33w x 5.59h. I coped my design to cut two to a page. I trimmed off an inch. You might wonder why I didn't just size the card smaller. I based my card width from the K&Co. card stack. I also liked having a one inch border to flip over and use on the front of the card. I scored the card at 4.25" measuring from the flat side. Put the strip on the front. I added some paper flowers made with my Sixxiz die and my cuttle bug and added a sentiment stamp. Here are my two simple yet cute cards all ready to go! In fact, I used one today! I would like to welcome all of my new followers and thank all of you for the sweet comments you left me. Can you believe that I thought this project would flop? I had so much fun making a Strawberry Flower Ball! I love your project and all that strawberry ribbon you used! It is wonderful!! Congrats Ashley, you have won a copy of Joy's Cricut Vinology DVD!!! 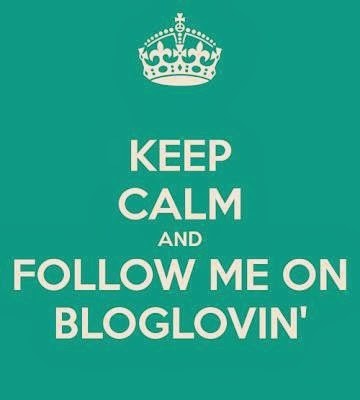 Happy Birthday Joy and welcome friends and followers to Joy's Birthday Blog Hop! If you found me first, please go HERE to begin the hop. You won't want to miss any of the projects!! Along with birthdays comes games and prizes right?!? Well, we all have some games (in a sense) and a prize for one lucky winner. Blog candy details are at the bottom of this post and the winner will be drawn and posted here on Tuesday, February 22nd! Lori - YOU ARE HERE! I cut out 1" circles out of white card stock and hot glued ribbon on it. I started in the center and wound it around and around. I put a brad in the center of the flower (shown down below). I cut out flowers from Mother's Day Bouquet. This flower is from the top row, third from the right and I cut it out at 3.63w x 3.39h in light pink. This flower is from the top row, second from the left and I cut it out at 2.82w x 2.61h in a strawberry pink color. This flower is from the top row, fourth from the right. I cut it out at 3.91w x 3.71h in red and also in white. These two flower layers are from the second and third row, fourth from the right. I used a dusty pink and a red patterned paper for these. I layered the ribbon flowers inside the red flower, but it needed a little something so I grabbed the green ribbon. I took the green ribbon and made loops (and stapled them together). Then I used glue dots to glue the pieces to the flower. I took the wide ribbon and tied a loop. Where the knot is, I wrapped 22 gauge beading wire around and then stuck the ends into the styrofoam ball. I pinned on the large layers of the flowers on the ball. I pop-dotted the layers onto the large layers once they were all in place. I made a total of 21 flowers. In order to fill up the empty spaces, I tied the remaining ribbon with white tule and pinned it to the ball. Here is the completed ball. This makes a beautiful decoration for a strawberry birthday party!! Now on to the present (blog candy). I will be giving away a Cricut Vinylology DVD from Joy's Life to one lucky winner. This awesome DVD shows how to use the Cricut Machine to cut projects out of vinyl. This can be purchased (along with some other great products) on Joy's website and right now she has FREE SHIPPING! I will draw the winner on Tuesday February 22nd using the Random Number Generator. All you have to do to qualify is to be or become a follower and leave me a comment. I would love to hear about your favorite party decoration too!! I will post the winner here, but if you leave me contact information I will contact you! Your next stop in the blog hop is HERE! You can see what Laura has made! Today's challenge at Frosted Designs is to use only solid colored paper. The easiest layout for me to create was a Disney layout! I saw a similar layout and adapted it. I used Mickey Font for the words and Mickey head. I used George for the stars. I used my Gypsy to lay the letters out the way I wanted them, then used the negative piece as a template to glue the letters down. This was one of the very first tricks I learned with my Gypsy and I use it all the time! I used an acrylic stamp to create a tag for journalin. I positioned the stamp on the paper so the top of the tag image was not on my tag. Since the plain paper needed a little something, I grabbed my ribbon stash and buttons! I also needed to put extra pictures on this layout, so I made a flip up (self-coined term). I take cardstock twice as long as the photos, fold it in half like a card, glue it to the page and cover the remaining 3 sides with photos or journaling. I put a little ribbon tab on one corner for easy lifting. I glued only the sides and bottom of the red paper on the bottom of the page to make a pocket. This way I can add additional pictures, maps and other memorabilia. 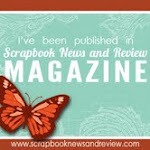 I have 4 trips in the last 4 years to scrapbook and I am a picture taker!!! Here is my finished layout (minus the photos) once again. I added some buttons and ribbon to break up the solid colors. Join us at Frosted Designs with your own projects using solid colored paper!! One of my goals this year is to make more of my own cards AND give them away!! I either make them so far in advance that I lose them, or forget until the last minute and then it is too late. A friend from my Gypsy class (Bonnie) gave me a Tim Holtz Flower die cut which I used to make this flower. I am having so much fun cutting different things with my cuttlebug that I can't really cut well with my cricut (newspaper, book pages, fabric, etc). I also cut out a bunch of sentiments like celebrate above and filed them in a plastic envelope thing so I am prepared for those last minute cards. I also ran the sentiments through the Xyron. No excuses!!! I made this card for one of my daycare moms for her birthday. It is simple, yet a little sassy just like me!! 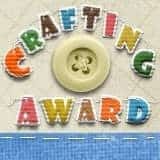 Do you have any other tricks that you use to make card making any easier for a fellow scrapbooker? I would love to hear them! !